I recently received three packages from generous BOTLs, each containing cigars with strange names, like Chupacabra (Goat Sucker), 5150 (police code for nut-job on the loose), and oddest of all, Colosseum. The first two, you can imagine the guy who named them was being facetious. But the third is a puzzle. Why name a cigar for a place famous for fights to the death? No notion. Saturated. Gives you a smooth waxy feeling on the tongue. A rich mulchy odor at the foot. A milder mulch odor on the wrapper. A faint salt and bitter taste. Tight wrapper. Firm pack. The cap seemed thick. It carved off easily. I foolishly neglected to note which way the wrapper was wound, which is essential knowledge when removing the cap with a pocket knife; so I botched the job a bit, so I left a bit of wrapper unwind. But that does not account for the fact that underneath the cap were wee shreds that spit out in my mouth. And they kept on spitting through the experience. This tells me this was no full length leaf job. The draw was free and easy; almost like there was nothing inside. Effortless. A single Diamond kitchen match toasted the foot. Tremendous volume of smoke right off the bat. Thick, heavy, clinging smoke. Great for smoke rings. Somnolent spice and muted glove leather. That's the flavor in a nutshell. Muted, sleepy, distant, and bite-less. This was an extremely well behaved flavor. Absolutely clean finish. Soft cedar retro. Spewed lots of smoke at rest. Barrels of smoke on the draw. But no stink in the garage. Smoke just traveled out the back door. Amazing how clean my mouth felt. No coating; hardly any stinkage. I was in the garage. It was 38 or 40 degrees. I settled in and really enjoyed this cigar. It's a softer version of the moody spice flavor that suits me so well. Medium grey ash not real strongly put together. I was working on Bearswatter's laptop, cleaning up the malware she regularly collects, de-fragging, etc. A real relaxing experience. Then about half-way, first it started to drizzle outside, then this wood flavor jumped in. I had to hit some beer to wash the wood off my tongue. About then, the cigar started to canoe. After that, the wood flavor turned ashy. I had to hit some rum. I am thinking that the cold outside, the damp, these affected the burn, and that ruined the flavor. 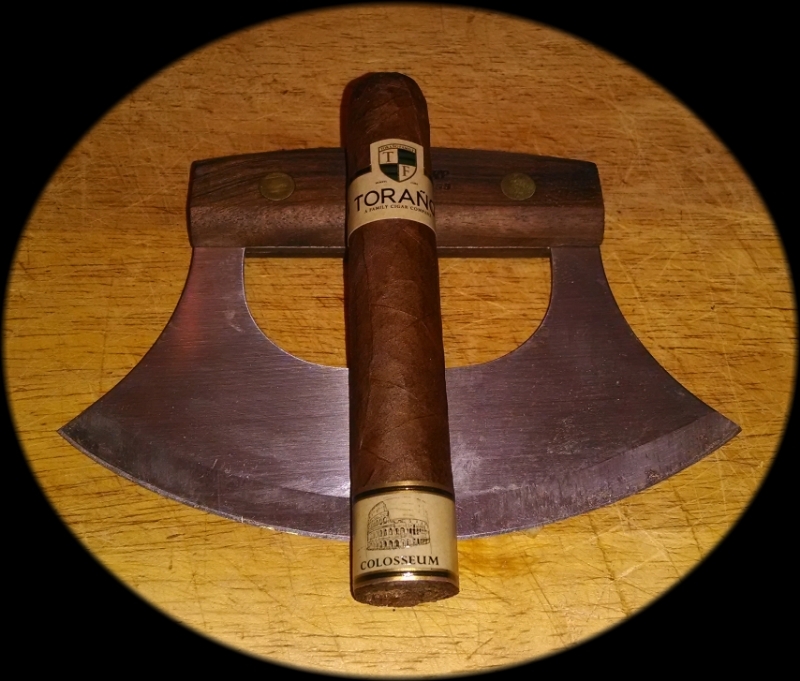 Because the front end of this cigar was a solid eight; but the aft end of this cigar barely rated a five. Then it went out. It came out of a warm house at 64 percent and went into a cold garage at 99 percent. Once the cold damp caught up with it, things went south. That's how I am excusing Toraño. I tell you, though, soon as I was done, I looked them up at cigar.com, and surely would buy a bundle of these, for no more than they are asking. On a better day, with a better burn would be a real good smoke. Excellent stinkfinger. I was loving these digits all into the night. Virtually no morning mouth. Zero wheeze. Great review. Sounds like another stick I need to try.